NuDawn Sparkle Cleaners in Prince Albert provides comprehensive dry cleaning services, working with every type of fabric and clothing item. Many services can be completed within the same day. Our professional cleaners work with any type of clothing that says “dry clean only” on the label. This includes button down shirts, dress pants, dresses, jackets, and much more. From silk to wool, we have specialized products and cleaning processes for every type of fabric. Whether your items need targeted stain removal or an overall cleaning, we can meet your needs. We’ll return your clothing to you smelling fresh and looking cleaner than ever before. NuDawn Sparkle Cleaners cleans and preserves wedding gowns to ensure your dress stays beautiful and in mint condition for many years. 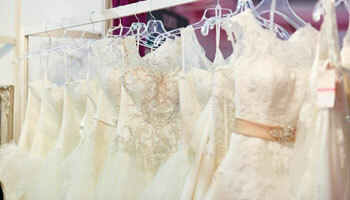 Preserving your wedding gown is important to prevent oxidation or yellowing of the fabric over time. We steam clean the dress to remove all dirt and sweat, repair loose threads or reattach beading if needed, remove any wrinkles, and box the dress in acid free paper. Your wedding dress will be easy to store. We’ll ensure this important piece of your special day will be ready to pass along to your daughter one day. We also clean any type of formal wear, including suits, tuxes, and dresses. Our professional cleaners will spot clean the items and remove wrinkles. We can also repair any zippers, hooks, or buttons, or loose beading if needed. We use new technology combined with time tested processes to remove any sweat and stains. We’ll also hang your items and place them in garment bags to ensure easy transport and storage. Our Prince Albert dry cleaners also provide leather and suede conditioning to clean and preserve the suppleness of these delicate fabrics. Bring in your vests, jackets, shoes, boots, and more and we’ll return them to you in like new condition. We use a specialized brush to remove any loose dirt, followed by spot cleaning and stain removal as needed. A moisturizing treatment is also applied to remove cracks and wrinkles in leather.